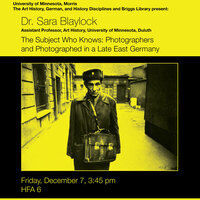 Dr. Sara Blaylock's research concerns the experimental art, film, and visual culture of the German Democratic Republic during the 1980s. Broader interests include official cultural policy in state socialism, the art and visual culture of the Cold War East and West, fiction and documentary film from the East Bloc, theories of aesthetics and politics, as well as global histories of modernism and post-modernism in the visual arts, particularly in Europe, the United States, and Russia. Her work has appeared in Cinema Journal, Gradhiva, post: Notes on Modern & Contemporary Art Around the Globe (Museum of Modern Art), ARTMargins Online, and Gegenstimmen. Kunst in der DDR 1976 – 1989 (Voices of Dissent: Art in the GDR 1976 – 1989).